UP FOR SALE IS A NEW LEAPFROG SCOOBY DOO & THE DISAPPEARING DONUTS LEAP 1 READING BOOK. IF CHECKOUT IS NOT COMPLETE WITHIN 72 HOURS A NON PAID CLAIM WILL BE OPENED. THE ITEM SEEN IN THE PICTURES IS WHAT YOU ARE BUYING. K - 2nd grade. 5 - 8 years. Works on number recognition, addition and subtractions and sequencing. Uncover clues using logic and reasoning skills to help solve the mystery of the sea monster and pirate ghost who are haunting San Francisco! Solve more than 50 logic and reasoning puzzles while exploring nutrition and food facts. NEW Leap Frog LeapPad 2 Activity READING Monsters, Inc. USED First Grade LeapPad Book Scooby-Doo and the Disappearing Donuts. for an authorized RMA number. MISTAKES HAPPEN and we understand that causes concerns and frustrations, and we will serve you sincerely. Collect hidden clues to solve the mystery (with three different endings!). Vtech Whiz Kid Learning System Scooby-Doo! Lost Island Adventure. Teaches: reading, science, numbers, counting, early math skills, logic & problem solving and more! 3 modes of play per activity page. I will always attempt to describe the item(s) with a reasonable degree of accuracy. LeapFrog LeapPad Leap 1 Bundle. Math Counting on Leap. Vocabulary Richard Scarry. Reading - Bounce Tigger Bounce. SELLING A LEAPSTER LEARNING DISNEY PRINCESS GAME... MADE FOR KIDS 4-7 OR KINDERGARTEN TO 1ST GRADE... ITEM IS LIKE NEW AS ONLY PLAYED A FEW TIMES... FAST SHIPPING AND NOTE MY 100% RATING! Digging for Dinosaurs. Animal Genius. Leap Frog - LeapPad. Scooby-Doo and the Disappearing Donuts. (30937) Scooby Doo: Miniature Gold Mystery, Museum Mystery, Haunted Theater. (33618) Dora the Explorer: Dora's Garden, The Gingerbread Boy, Dora's Art Adventure. (33480) My Little Pony: Star Catcher's Starlight Party. Frogger's Adventures, Temple of the Frog. Titles include Namco Museum. Scooby Doo 2, Monsters Unleashed. Kirby, Nightmare in Dreamland. Touch the words with your Reader and hear them aloud! New Whiz Kid Learning System Scooby-Doo! Lost Island Adventure K: Whizware-for use with the Whiz Kid Learning System. Teaches: reading, science, numbers, counting, early math skills, logic & problem solving and more! Miniature Golf Mystery. Story Reader. Policies & Info. New, Never Opened. LEAP FROG - LEAP - 1 MATH. VTECH VSmile SmartBook cartridge: SCOOBY DOO-A Night of Fright is No Delight! Children can learn and practice the following skills Hard to find, out of production! Leapfrog Leap 2 Reading Scooby-Do And The Haunted Castle Book & Cartridge Condition is New. Shipped with USPS First Class Package. For Use Only with Whiz Kid Learning System. Reading, Letters, Simple Math, Numbers, Geography, Science, Logic Skills, Animals. Logic Tree House. Lost Island Adventure. NEW UNOPENED. Sutable for Grade: K.
It is haunted and scares away all the scientists and historians. It's up to Scooby-Doo and the rest of gang to explore 5 different areas to get clues to help solve the mystery! Teaches: reading, science, numbers, counting, early math skills, logic & problem solving and more! RARE VTech Mobigo Touch Learning System Scooby Doo! Mystery Town Age 5-8 Years. Condition is Used. Shipped with USPS First Class Package. New unopened Scooby-Doo for Fisher Price iXL. You are purchasing a WizKid Learning System with the Wondertown and Scooby Doo Lost Island Adventure. The Whiz Kid System was tested. Brand new in factory seal!! FISHER PRICE IXL LEARNING SYSTEM SCOOBY-DOO! 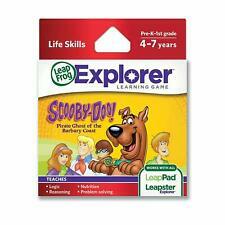 AGE 3-7 Brand New FREE SHIPPING..
You are buying a FISHER PRICE IXL LEARNING SYSTEM SCOOBY-DOO! 6 WAYS TO PLAY. ENDLESS WAYS TO LEARN. 2 BOOKS: LEARN TO WRITE LETTERS WITH MR. PENCIL AND LEARN TO WRITE NUMBERS WITH MR. PENCIL. Spiderman & Friends Secret Missions. 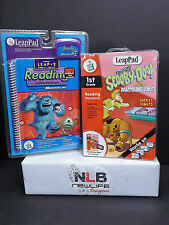 2001 Leapfrog Leap 2 Reading Scooby-Do And The Haunted Castle Book & Cartridge Brand new and factory sealed.